Green Smoothies are all the rage. If you’re going to have a smoothie and your committed to getting healthy, why not include some greens. The best part of making a smoothie is the “sneaky factor” You can make a regular fruit smoothie and add in the green but the flavor won’t change. That’s part of the fun. The look on people’s faces when they see this green drink…it’s always the same look of disgust, but then they take a drink and they’re shocked at how good it tastes. Looks can be deceiving, so drink your greens! I bet you didn’t know that Spinach contains an impressive range of active substances which are indispensable to the body. In its structure we find mineral salts (sodium, potassium, calcium, phosphorus, magnesium, sulfur, iron, zinc, manganese, iodine, copper), vitamins (C, B1, B2, B6, PP, E, K, folic acid, vitamin A), chlorophyll, amino acids such as arginine and lysine, but also lipids, protides, glucdes and fibers. With only 17 calories, 100 grams of spinach supplies the body with 5 mg of iron, 500 mg of potassium, 170 mg of calcium, 23 mg of vitamin C, 2 mg of vitamin E, 150 micrograms of folic acid, 3500 micrograms of beta-carotene and 7 grams of alimentary fibers. Because of this, an alimentary diet which contains spinach, leads to the strengthening of the body. 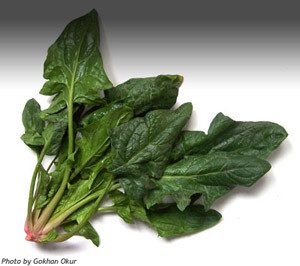 The magnesium contained in spinach helps prevent diabetes; iodine helps treat skin diseases and strengthens the immune system; vitamin K contributes to bone resistance; vitamin B improves cerebral activity, helps in maintaining the firmness of the skin and controls insomnia; potassium stimulates the cardiac muscle; beta-carotene prevents sight problems and sulfur increases hair attractiveness. Alimentary fibers, vitamins and minerals contained make spinach a good depurative and detoxifier. The toxins originating in nourishments that are rich in fat and proteins of animal origin are thus eliminated quickly. At the same time, alimentary fibers prevent constipation and colon cancer. They interact with the absorption of fat and adjust the level of cholesterol in the body. Moreover, spinach can help eliminate intestinal parasites. All of these are sufficient reasons to start a diet based on spinach or at least for introducing it more often into everyday nourishment. By being nutritive, tonifying, mineralizing, calming for the nervous system.